It's Friday, the girls are out of school today and the sun is shining. You can't ask for much more. They helped clean up the house today so fingers crossed, I won't have to do much cleaning this weekend. Ha, I can wish right? We did make something new for lunch today. Have you heard of this casserole? I've seen tons of different variations across the Internet but have never made such a thing. I'm typically not fond of the whole cottage cheese/ricotta mixture in my lasagnas, etc. I don't know what it is, maybe the texture or the extra creaminess or just the fact that's it white. I think it's really just all in my head. I blame it on my mom, that lady will not eat anything with cheese in it. But I wanted to try something new, but with my own twist on it of course. I've still got a few containers in my freezer of my favorite spaghetti sauce so I knew we had to incorporate that into the dish. I think it's safe to say everyone liked it. It's almost like a lasagna, especially the way everything's sort of layered together. You can use any type of pasta you have on hand. I didn't have any spaghetti so we substituted cellentani or corkscrew pasta. The kids enjoy the different shapes. The casserole itself is really easy to assemble. We made it right before lunch and popped it into the oven. You could also prepare it the night before or right before work in the morning and then let it chill in the fridge during the day. Just remove when you get home and then bake. If you choose to use ricotta instead of cottage cheese, I think this would also make for an excellent freezer meal. Double the batch and divide into two small 8x8-inch pans and you've got two meals. Or possibly one to share, I'm sure you know of a new mom, neighbor or friend that could use a nice, homecooked meal! Over stove top, prepare pasta according to package instructions, cook until al dente. Preheat oven to 350 degrees, if baking right away. In a medium bowl, beat together cream cheese, ricotta and sour cream. Season with the parmesan cheese, garlic powder, salt and pepper. Combine well and set aside. 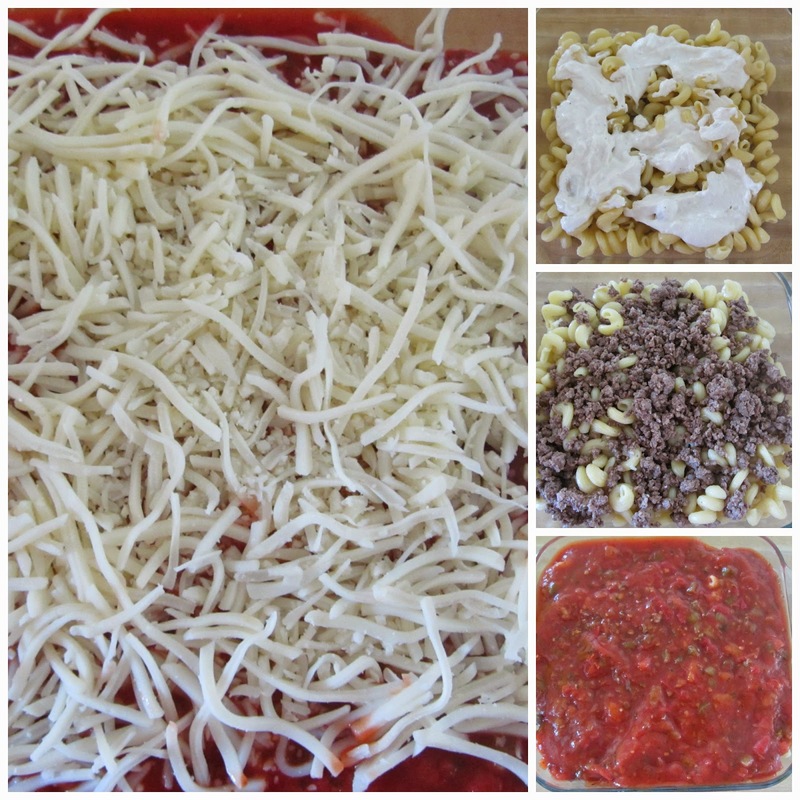 When pasta is done, lightly grease the bottom of an 8x8-inch baking dish. Spread half of pasta in the bottom of the pan. Drop dollops of ricotta mixture over the pasta. Sprinkle a little bit of the meat over the ricotta. Then add the remaining pasta, top with the remaining meat. Pour spaghetti sauce all over the casserole. Top with the mozzarella cheese. Bake in the oven for 30-35 minutes. If not baking right away, cover with foil and place in fridge until ready to heat. If you'd like to freeze; cover tightly with foil, label and place in freezer when completely cooled.